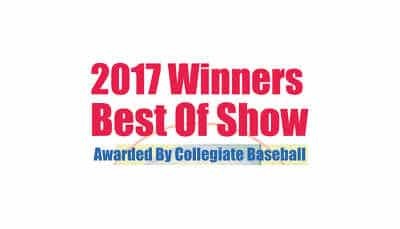 We are excited to announce that FlightScope's baseball unit, FlightScope Strike, was awarded Best Of Show by Collegiate Baseball at the 2017 American Baseball Coaches Association (ABCA) Convention. The 73rd ABCA Convention consisted of meetings, clinics, and the ABCA Trade Show that had over 300 companies displaying state-of-the-art equipment and products. FlightScope was there for the second year in a row, showcasing the FlightScope Strike.For the 18th consecutive year, Collegiate Baseball newspaper chose the top new products at ABCA. Here's the excerpt from Collegiate Baseball's Best Of Show article:"FlightScope Strike is the first multi-frequency 3D tracking radar for baseball that provides pitching, hitting and pop time analysis. The product is unique because it is portable and is suitable for both indoor and outdoor use. The interface will allow coaches to focus on pitching data such as velocity, spin rate, spin axis, spin tilt, V-break, H-break, induced break, V-movement, H-movement, zone command, release extension and pitch trajectory. The hitting data that you can uncover includes exit speed, carry distance, launch angle, batted FlightScope Strike ball direction, hit spin, zone performance, location trends, spray chart and flight trajectory. Pop time data includes pop time, handover time and flight trajectory. Coaches and players can keep track of stats over time, spot tendencies and follow improvement. The technology has been used in missile systems and took four years to develop for baseball after years of expertise in the golf industry. FlightScope Strike brings MLB Statcast next-gen data to player development at all levels of play. This product, which was the official radar tracking technology of the Area Code Games, represents the state of the art in sport measurement technology enabling players to analyze every single aspect of their game with ultimate precision. This technology is only limited by your imagination. One high profile program uses FlightScope to find out what the pop time is for each infielder on throws to first base. It is a high end product at $18,000 but is a precision instrument that will help baseball coaches and players track important information. For more information, go to their website at: www.flightscope.com/baseball".